You hear the self-indictment again and again: “I really should be better about keeping up with the literature,” “I need to read more,” “my goal for the year is #365papers”. Do you know anyone that says “I read too much”? How about, “I’ve got it all down pat and read just the right amount to keep up with the literature”? Yeah, me neither. Now maybe it’s just that people who might say those things are sufficiently humble. But I suspect at least one of them would have written a “how-to” paper or blog post by now. So basically no one feels like they read enough to know what’s going on everywhere and all the time in their field. And yet there are plenty of very successful scientists out there. So what’s going on? I suspect that this idea about “keeping up with the literature” is an outdated one — a cultural holdover from when fields were more compact, publication rates were slower, and you actually could keep decent tabs on what your peers were reading. I’ll point out that in some other fields less sprawly than ecology, there are aggregators that actually do allow scientists to more-or-less keep up with literature in their field. No such thing exists in ecology — or even a subfield of ecology — to my knowledge. Not too long ago people read hard-copy newspapers for their news. Scientists received paper copies of journals weekly or monthly to read. The amount of easily-accessible information was small, and it was possible to read it all. Of course, it’s important to note that while these people might have thought that they were up-to-date on the news/scientific literature, they were missing a big chunk of information. The local newspaper was light on international news, for example. And scientists picked a handful of their favorite journals to subscribe to, missing all the related information that appeared in other journals. Not too long ago people used implicit filters — which newspaper to subscribe to, which journals to read — and made sure their filters matched those of their peers. Now information is much more accessible. And that is a good thing. But it also makes it harder to choose what information to consume. Instead of implicit filters, we often need to construct explicit ones. My feeling is that older scientists who are used to the up-front filter still try to use this method: they read journal tables of contents, for example. But younger folks have grown up with an on-demand just-in-time information approach. They know that when you have too much information to consume, you don’t sort it, you search it. And you become comfortable with missing things, because you rely on your social networks to bring anything you missed that is important to your attention. And if you and your social networks miss something important when it comes out? No big deal. That important article is waiting at your fingertips for when you do discover it. Being comfortable missing things is not easy, but is important, I think, for doing science these days. I personally read in spurts. I read a lot when I’m thinking about starting a new project. And I read a lot when I’m writing introductions to papers. But my reading is quite targeted in both cases and I do a lot of explicit searching. In the interim, I rely on pointers from my lab groups and my colleagues to important articles I should read, as well as picking up stray articles here and there based on my social media accounts and Google Scholar’s suggestions. Have I missed things? You bet. In fact, I missed just about everything published between about 6 months gestation and 9 months postnatal for both of my kids. That’s 2 years of literature or about 20% of the time I’ve been working in ecology. But I didn’t miss everything. I still got pointers to the most important articles and simply read them later when I had more time. 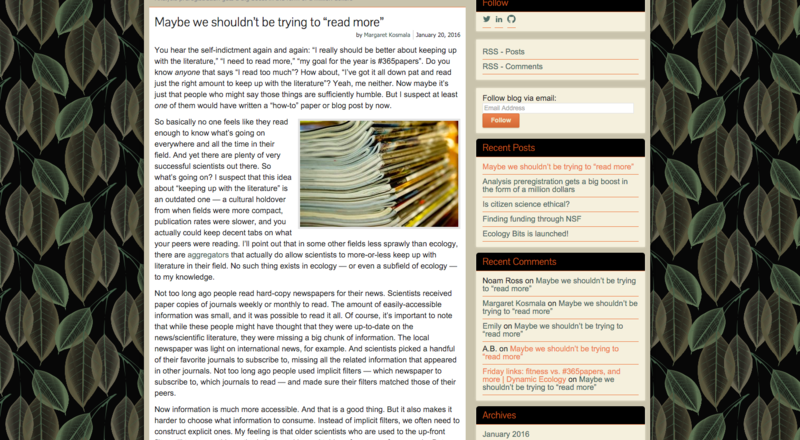 I sometimes discover a cool article from those gaps when doing a spurt of reading. And this is fine. When someone says “I should read more,” what I hear is: “I’m afraid of missing something.” I humbly suggest that missing things is unavoidable, but you’re unlikely to miss important literature for very long. Instead of resolving to read X number of papers per week/month/year, maybe it’s better to focus on strengthening your scientific networks. Maybe instead of resolving to read “more”, resolve to forward links to cool papers to your colleagues (via email, Twitter, or whatever makes sense for your particular network) and encourage them to reciprocate. Maybe instead of trying to keep tabs on everything being published, join or form a journal club on a topic that interests you to help search the literature more efficiently. And in any case, don’t spend energy worrying about “keeping up with the literature” in the old sense. That train has left the station. Yeah, I remember that poll (and found it surprising at the time). But that was more than TWO whole years ago. The world has moved on! Okay, no seriously, I would hypothesize that people checked the TOC option because that’s how they’ve been trained to “keep up with” the literature. (Heck, I probably checked it when I filled out the poll.) I tried and tried — and mostly failed — the TOC method. And I think many people fall into that category. So perhaps many people do use it, but they stress about not really doing it properly or enough. Not sure if I’m really an outlier or not in terms of actual practice, other than deciding to stop stressing about a method that wasn’t working for me. Also, a minor point, but maybe one that wasn’t clear in the post: I get a lot of papers-to-read through my social *networks* — more of them from talking to live people and email referrals than social media itself. I also probably checked the TOC option in the poll because I always did it in the past and my inbox is full with alerts. I am finding those emails more often than not go unopened these days. I can’t keep up with them, let alone the literature! 🙂 But as time passes I am finding my style more like Margaret’s–short bursts of deep reading and hearing about relevant papers through googlescholar and social networks. I think I concur with Margaret and Amy here. I think I checked the TOC option because that’s how I thought I *should* be keeping up, but if I’m honest with myself in far, far less likely to check the backlog of TOC than read what my colleagues are forwarding around, and then I search when I need to know more about a topic. 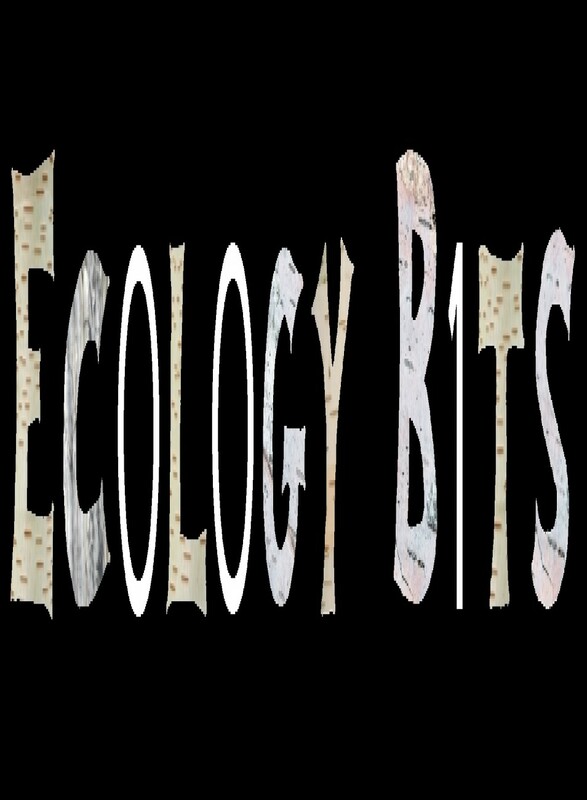 I’m discovering your blog via Dynamic Ecology; I’ve enjoyed reading your comments there, so I’m looking forward to reading your blog! Anyway, I’m looking forward to reading the next posts! I am concerned about readability and want to make sure it looks okay across a wide variety of possible reading devices and browsers. I totally agree with you. I am relatively ‘young’ (postdoc-ing now) and I find that I do targeted searches all the time, and there are very few journal TOC that I look at (maybe 2-3 journals). I get lots of suggestions from Twitter, colleagues, Google Scholar + I review lots of papers and find things that way too. I think I would spend all my day reading papers if I didn’t do some sort of targeted key-word search. Also, as a post-doc, I tend to get thrown half-written papers to polish up and get out, and I’m not necessarily up-to-speed on those specific topics as much as my own research, so I have to rely on the targeted search method there almost exclusively. In fact, it kind of freaked me out when I read about how much TOC reading others did, so I’m comforted to read your post!